expensive. I bought this one at an auction for $15.00! wanted to share it with you anyways. 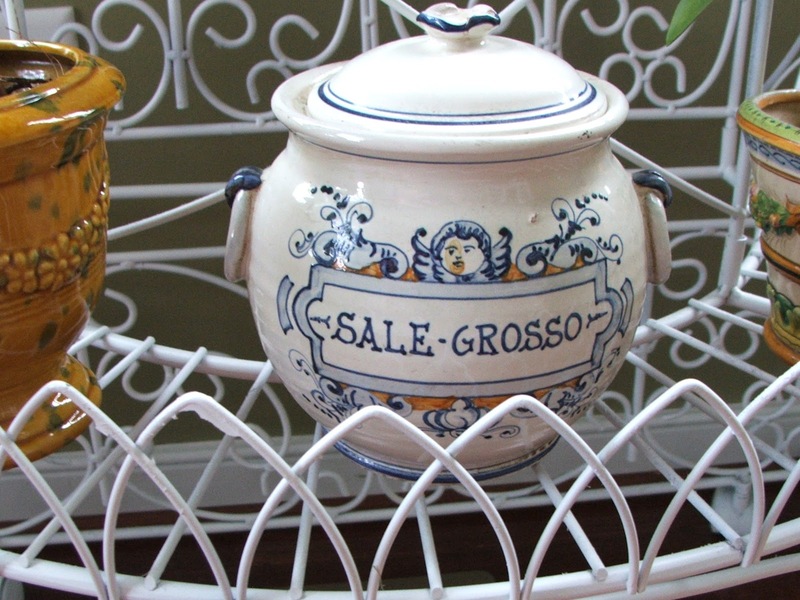 The salt (sale) jar was purchased on a trip to France. so appreciate your friendship and your prayers for my dad. 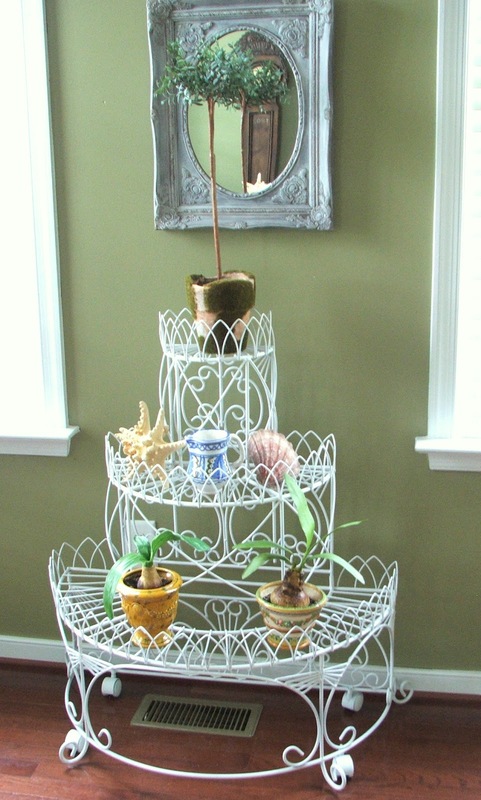 What a great tiered planter, Sherry! I love it and you got it for great price! I love it! What a super price too. I can only imagine how beautifully you will style it too. Sherry, what a beautiful accent! I'm glad you were able to get exactly what you wanted at a great price! I think of you and your dad and lift you both up. 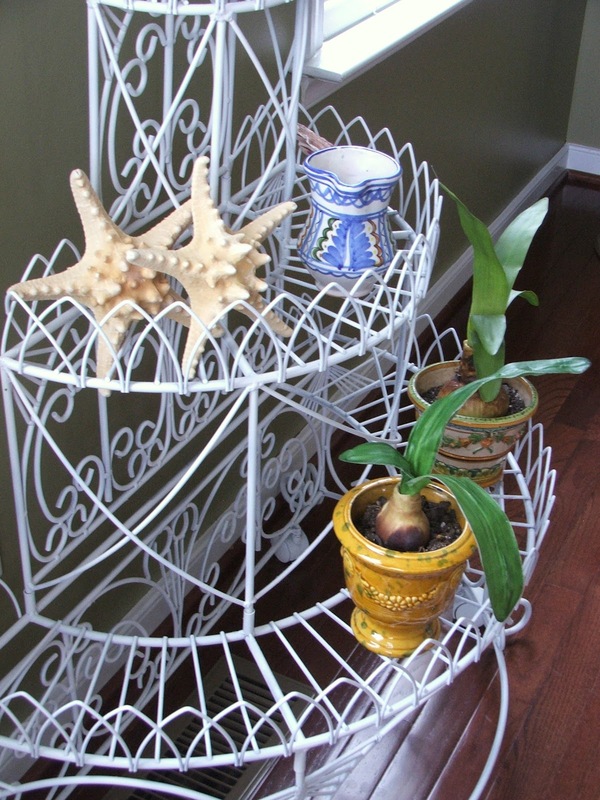 Sherry, your wire planter is too cute! And you found the cutest spot for it!!! Awesome price! 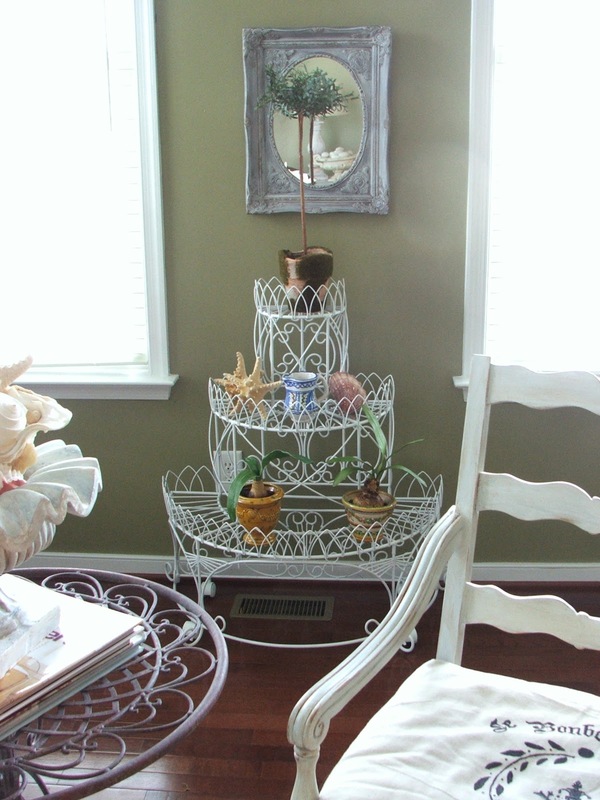 Your wire tiered stand is very pretty! It reminds me of the ones in Victorian days that you'd place flowers on for your porch. I know you will have fun styling it many different ways in the years to come. Hope you're doing well with your dad. Nice piece, Sherry. Love the price too. It is beautiful…I can't wait to see what you do with your new home…. Very pretty accent piece. You almost got it for free!! Wow, this is so cute and the price was great! You and your Dad have been in my prayers! You're a great daughter! It's good to see you on line! Take care! Great piece and great price! Love it! I'm keeping you and your Dad in my thoughts and prayers. Love the planter and the mirror painted with your DIY chalk paint! Thinking you and your dad and keeping you both in my prayers. My blessings to you Sherry. Omg! love the planter. What a bargain at $15. Awesome! It looks great! Keeping you & your dad in my prayers. Thanks! for sharing. Take care & Happy Autumn. Hi Sherry, love that planter. OH, love the jar from France, too. I didn't realize I hadn't added you back to my blogroll. I lost it when I moved to .net. Hope all is well. That is a lovely planter. I saw one, but much smaller, at a local antiques shop for $50. Love your plant stand. It looks like a great resource for future displays. I always laugh when I encounter your blog because its name is pretty much the story of my life too. When I hear about people wanting a space "bare and not fussy" it makes me shake my head. I want colors and textures and plenty to look at! The tiered planter is a terrific piece! You will have fun styling it when the time is right. Hi, Sherry. Sorry to hear about your dad. I will be praying as well. I've been absent as well. I finally got to take my dream trip to Paris and it was wonderful. I see your salt keeper that you got in France and I have always loved tiered planers like the one you got.